← Let’s Root for Montreal’s Bagels! As if answering your question, Calvin Trillin, in a November 2009 column in The New Yorker, acknowledged the reply that most Montrealers would likely give when he remarked “smoked meat was probably Montreal’s best-known food…”. “When you’re in Montreal, you must go to Schwartz’s” opines The New York Times (a headline that I have been unable to track back to the original – but come from a poster on the wall of the restaurant itself). Small wonder, perhaps, that Schwartz’s restaurant has recently been the subject of a stage musical (called – yes, you’ve guessed it — Schwartz: The Musical) that ran in Montreal’s Centaur Theatre to packed houses in early 2011. I have the t-shirt. As the place for the food, the epicenter of smoked meat in the city, there is no doubt in the minds of many that Schwartz’s is Montreal. Certainly, it fits the bill of an “iconic food” – to borrow Jennifer Berg’s helpful term – and, as an iconic food becomes one that we do not have to eat (or like) before we will recommend it to others. Like the newspaper headline, smoked meat has passed into legend and becomes a marketer’s dream. I won’t answer that last one — on the grounds of personal safety — but as to the historical background of this story, I can turn to Eiran Harris, perhaps the authority on Montreal smoked meat. In an interview in Cuizine, he ascribes smoked meat’s origins to Jewish immigrants from Eastern Europe who, in the late nineteenth century, brought with them a familiarity with the meat known as pastrami in Yiddish. Once in Montreal, he notes, two ways of making smoked meat developed. The ‘dry cure’ used the brisket, a cut of meat taken from a steer’s forequarters, which was then rubbed with salt and spices and left to soak for between 12-20 days, before being smoked for six hours. A subsequent development, the ‘wet cure’ reduced the soaking period to about four days to speed things up, and one final innovation, “steaming” the meat for three hours, replaced volume that the brisket had lost through curing. For the record, Schwartz’s (established in 1928) uses the traditional “dry cure” with a final steaming before slicing and serving. Oh – and how is it different from pastrami? Let me turn to Montreal food writer and Montreal Gazette columnist, Bill Brownstein, who is brave enough to record a view on this contentious matter. He writes that Montreal smoked meat “can be differentiated from pastrami or corned beef by its higher ratio of fat and spice, which connoisseurs will attest accounts for its superior taste’ (2006, 17). Be that as it may, just for the record, there are some basic differences between the two. “New York” style pastrami, according to Bacon’s entry on the subject in the Oxford Encyclopedia of Food and Drink in America, uses plate rather than brisket – a superior cut of beef and one usually dry-rubbed with a mixture of spices and then refrigerated for up to ten days before smoking. 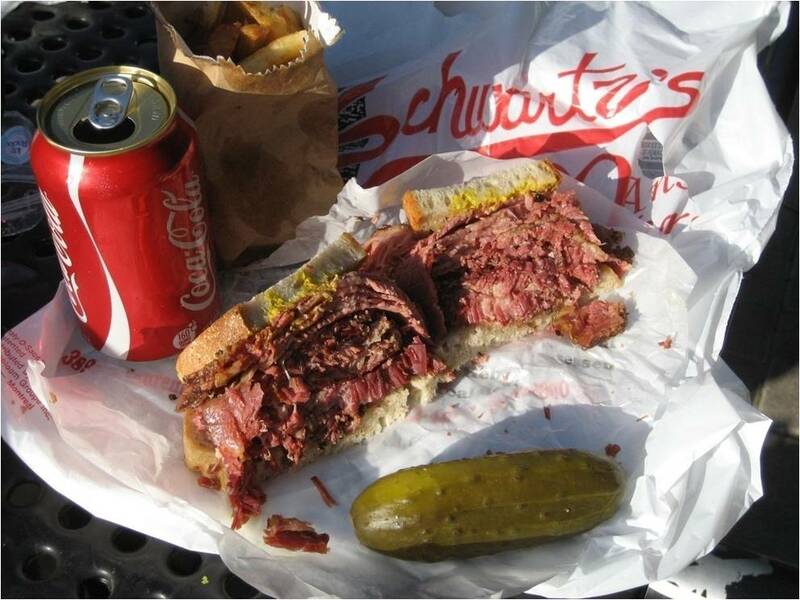 Debates about smoked meat in Montreal are always hard to settle, but no one doubts that the secret of Schwartz’s success must lie in a heady combination of its ability to serve top-quality smoked meat, and the publicity that has come to surround both the food and the place. Bacon, J. ‘Pastrami’, in Smith, A.F. (ed. ), The Oxford Encyclopedia of Food and Drink in America. New York: Oxford University Press, vol. 2, 2004, 240-241. Berg, J. ‘Iconic Foods’, in Katz, Solomon H. (ed. ), Encyclopedia of Food and Culture. New York: Scribner, vol. 2, 2003, 243-244. _____. ‘From the Big Bagel to the Big Roti? The Evolution of New York City’s Jewish Food Icons’, in Hauck-Lawson, A. and J. Deutsch (eds. ), Gastropolis: Food and New York City. New York: Columbia Press, 2009, 252-273. Brownstein, B. Schwartz’s Hebrew Delicatessen: The Story. Montreal: Véhicule Press, 2006. Harris, E. ‘Montreal-Style Smoked Meat: An interview with Eiran Harris conducted by Lara Rabinovitch, with the cooperation of the Jewish Public Library’, Cuizine: The Journal of Canadian Food Cultures vol.1 no. 2, no pagination [e-journal article accessed on 2 March and 8 April 2010 at www.erudit.org/revue/cuizine/2009/v1/n2/037859ar.html] . Trillin, C. ‘Canadian Journal: Funny Food’, The New Yorker (23 November), 2009, 68-69.